After Isha or Tarawi one only needs to look up at the sky on a cloudless night to realize that the blessed month of Ramadan is almost over. As Leila-tul-Qadr nears: Supplications for acceptance, forgiveness, and mercy from The Almighty, The One and Only. The word 'qadr' means 'decree.' It also means 'majesty or high esteem.' Laylat ul-Qadr, or the Night of Qadr, means the Night of Decree, or the Night of Majesty. Laylat ul-Qadr is a very blessed night. It is the best night of Ramadan, rather, the whole year. It should be noted here that sending down the Quran on Laylat ul-Qadr does not mean that it was revealed all at once to the Prophet (pbuh). It implies that the Quran began being revealed on that particular day. It was then revealed in small segments, as necessary, over a period of 23 years of the Messenger's (pbuh) life. Allah Almighty confirms in His Final Message that this Message will be forever protected on a "guarded tablet" (Lawh-ul-Mahfooz). In other words, it's a confirmation and an amazing prophecy that the Glorious Quran will always remain original and protected from corruption by human hands like the previous Scriptures. The same applies to Allah's decrees. They are not formulated on this specific night every year. Rather, Allah, with His encompassing knowledge, knows all what will happen in future and has recorded it. On Laylat ul-Qadr, HE issues His decrees pertaining to the following year (life, death, sustenance, etc) to the angels. And Allah knows best as for the rest of the details. We are not to speculate of what we have no knowledge. Laylat ul-Qadr is the most blessed night. A person who misses it has indeed missed a great amount of good. It is recommended to make a long Qiyaam leil (night prayers) during the nights in search of Leilat-ul-Qadr. It is also recommended to make extensive supplication on this night and all nights of Ramadan in search of the Night of Qadr. This calls for abandoning many worldly pleasures in order to secure the time and thoughts solely for worshiping Allah. 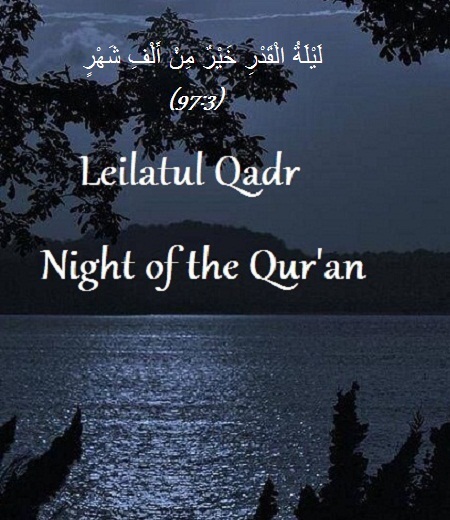 In the Glorious Quran the day or date of Layla-tul-Qadr has not been mentioned, instead Allah only states that the Quran was revealed (that is, began being revealed) in the month of Ramadan. "The month of Ramadan in which was revealed the Qur'an, a guidance for mankind, and clear proofs of the guidance, and the Criterion (of right and wrong)." (2:185). Reports that Layla-tul-Qadr comes during an odd night among the last 10 nights of Ramadan (that is, 21, 23, 25. 27 or 29) have been derived from various man-written Hadiths with NO evidence of authenticity. This is NOT supported by the Quran. Allah makes NO mention (not even any hints) on which date of Ramadan the Quran began being revealed in Ramadan. It is possible that the reason Allah did not reveal the exact date of Layla-tul-Qadr was to avoid people from limiting their worship to just that one night. This is an opinion. The actual reason is only known to HIM. Thus, the entire month of Ramadan must be spent in deep devotion to the Almighty Allah. So, one may ask, as Quran-only followers why do we observe the night of 26th Ramadan? The answer is simple. It doesn't matter which day of Ramadan we choose for additional worship in commemoration of that particular day. No matter which day any one observes as Layla-tul-Qadr, will be a supposition as that actual day within Ramadan is known to Allah alone. The jurists have decided upon 27th Ramadan based on Hadith. Thus we can also stick to that, not because Hadith says it, but for the purpose of unanimity and convenience as part of a community. 27th Ramadan is a presumed day for Layla-tul-Qadr, and if any one selects some other day, it would also be presumed. It makes no difference as long as it's within the month of Ramadan. The Quran is the Only Divine Literature in the world today and forever until the Day of Judgement. It is fully original and will remain so. It must be remembered that the altered Old and New Testaments are NOT the counterparts of the Quran. They are the counterparts of the man-written Hadith. Also please note that there are various stories among people about the Night of Qadr and unusual incidents happening on this night. Such stories are NOT reliable and must NEVER be accepted as Allah has given us NO warrant to believe in them. For Leilatul Qadr 2010 click HERE. and JazekAllah Khair dear brother for illuminating the board with such a great topic. InshAllah, i look forward to benefitng much more from your wealth of knowledge, Alhamdulilah. With the traditional observation of Leilatul-Qadr being just one night away and our masjids sending messages about the last 10 days of Ramadan based on Hadith, it was refreshing to read the above information, kindly contributed by Brother Truth Seeker and Sister Zeynab, eliminating the Hadith guesswork and taking the facts exclusively from the Quran. I thought of writing a fresh piece in this thread of the above information by compiling the relevant Quranic facts on the Night of Qadr for the convenience of our readers and how to follow the Truth despite the deviated interpretation of Hadith being far more rampant around us. Leilatul Qadr (The Night of Power or Night of Destiny) is traditionally observed on the night between 26th and 27th of Ramadan. For those who do not know the significance of this Night: The Glorious Quran, Allah's Final and original Message to humankind, was revealed on the month of Ramadan and believers are ordered by HIM to fast for 30 days of that month from dawn to nightfall. "The month of Ramadan in which was revealed the Qur'an, a guidance for mankind, and clear proofs of the guidance, and the Criterion (of right and wrong). And whosoever of you is present, let him fast the month ..........." (2:185) Al-Baqrah. "eat and drink until the white thread becometh distinct to you from the black thread of the dawn. Then strictly observe the fast till nightfall" (2:187) Surah Al-Baqrah. Leilatul-Qadr ("Night of Power" or "Night of Destiny") marks the anniversary of the Night on which the Prophet Muhammad (peace be upon him) first began receiving revelations from God Almighty through the angel Gabriel. We know for certain that it's one of the 30 blessed nights of Ramadan during which the revelation of the Quran began from Allah (The Highest) to beloved Muhammed (pbuh) as the Final Message for entire humanity for all times to come. Only Allah knows the precise Night of Ramadan the Quran began being revealed. The 97th Chapter of the Noble Quran, Al-Qadr, is about the Night of Qadr (or the Night of Power), that is, the Night the Quran was revealed. Reference to the Night of Qadr is also found in Verses 3 & 4 of Surah Ad-Dukhan, Chapter 44. "Lo! We revealed it on the Night of Predestination. The angels and the Spirit descend therein, by the permission of their Lord, with all decrees. (The night is) Peace until the rising of the dawn." (97:1-5) Surah Al-Qadr. "We revealed this (Quran) in a blessed night (Laylat Al-Qadr); for We wanted to forewarn mankind. In that night every matter is decided wisely." The Glorious Quran, (44:3-4) Surah Ad-Dukhan. 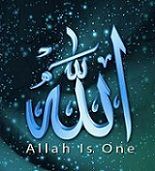 On this Night every year, Allah decrees His wise ordainments, appointing matters of life, death, sustenance, disasters, etc etc. and the angels descend with these decrees. This has been confirmed in Surah Al-Qadr. It is recommended to make lengthy Qiyaam-e- leil (nafl night prayers) during the nights in search of Leilat-ul-Qadr. We search for the Night of Qadr throughout the month of Ramadan because Allah decided not to disclose its exact date. Reports that Layla-tul-Qadr comes during an odd night among the last 10 nights of Ramadan (that is, 21, 23, 25. 27 or 29) have been derived from various Ahadith. This is not supported by the Quran. Allah makes no mention (not even any hints) on which date or likely dates of Ramadan the Quran began being revealed. It is possible that the reason Allah did not reveal the exact date of Layla-tul-Qadr was to avoid people from limiting their worship to just that one night and ignoring the rest. This is an opinion. The actual reason is only known to Allah, and there is definitely a reason; nothing with HIM is without a reason. Thus, the entire month of Ramadan must be spent in deep devotion to the Almighty Allah, as much as our schedule allows us. "We shall make thee read (O Muhammad) so that thou shalt not forget Save that which Allah willeth. Lo! He knoweth the disclosed and that which still is hidden;" (87:6-7) Surah Al- Aala. In the above Ayats, Allah says that He makes the Prophet remember those of His revelations which He wills. Only Allah knows what is disclosed and what is hidden. The date of the Night of Qadr is hidden. It could be on any night of Ramadan, not necessarily on the last 10 nights. Since Allah has decided not to disclose the exact date of the night of Ramadan when the His revelations began, we must accept it and not indulge in guesswork. If we decide to follow the traditional practice of observing Leilatul-Qadr on the night of the 26th of Ramadan, it should be observed on that night with the intent of commemorating the Night of Power (whichever one it is) and dedicating our additional worship to that Night .... and only Allah knows its exact date in Ramadan. Many Muslims spend the last ten days of Ramadan in seclusion, remembering Allah Almighty without worldly interruptions. This is called E'tekaf. It's a beautiful practice and these days of seclusion should be dedicated to the hidden Night of Qadr. Br.TS a big thanks again for this post and your additional comment. Many thanks Sister Heba. That's an excellent recap of a very important topic, the most important step is taking the information meticulously from the Quran. InshAllah, hope all of this helps our readers to understand the exact Quranic stance on Leilatul-Qadr. Alhumdulilah. Leila-tul-Qadr, Monday night. Reminder to all our readers. O, so nice Ameen ya Allah. Hia folks May our observance of this great Night be fruitful. May Allah grant acceptance. Many thanks for this dynamic, all-inclusive piece written by Br. TS on Layla-tul-Qadr. It helps each year in renewing the readers' knowledge. All the best to everyone, have a great, soothing and comforting Layla-tul-Qadr. Normally we would love to spend this night at the masjid. But our past experiences make us feel observing it at home is a far better idea - more peace at home and we're able to pray more with better concentration. Not to mention, the way many of our masjids have commericalized Laylatul Qadr as they've done with Hajj - several masjids charging over $150/- per family arranging Laylatul Qadr in elaborate venues and costly metro centres. You're absolutely right Sister Heba. A family gathering at home offers a much more pacifying observance of this great Night. I always do my nafls at home. I've heard many people coming up with similar complaints - often too noisy and asking for too much money for attendance in the name of donation. May Allah Almighty grant you and your family a blessed Leila-tul-Qadr. Remember us all in your prayers dear Sister. May Allah Almighty grant you and your family a blessed Leila-tul-Qadr. A load of thanks Sis, same to you and your family. Remember us all in your prayers dear Sister. As-Salam Alaykum everyone. May all of us have a blessed Layla-tul-Qadr on upcoming Monday night (Ramadan 26, July 14). Ameen. That sounds lovely. Btw, how have you folks organized it .. I mean what will be the steps? At our place, first everyone to offer Isha, Isha nafl of 20 rakahs, then reading various passages of the Quran with translation (different people have selected different passages) and discussing over it. Closing with another 8 rakahs of nafl .... and then Fajr. .... Btw, how have you folks organized it .. I mean what will be the steps? At our place, first everyone to offer Isha, Isha nafl of 20 rakahs, then reading various passages of the Quran with translation (different people have selected different passages) and discussing over it. Closing with another 8 rakahs of nafl .... and then Fajr. MashAllah, very wisely planned. Here it's somewhat the same with slight differences. Everyone will gather downstairs after Isha which they'll offer in their own suites, and start with Nafl (20 rakahs). Then one of my uncles will do the reciting of the Quran and reading translations (several selected passages of Surahs) . Then discussion. Then 4 rakahs Nafl before Fajr.